What is Melanoma & How Is It Treated? You’ve probably heard the term “melanoma” thrown out in conversations about skin cancer, but what exactly is a melanoma? Today, we take a closer look at melanomas and explain how we work to treat them. Melanoma is the most dangerous form of skin cancer. 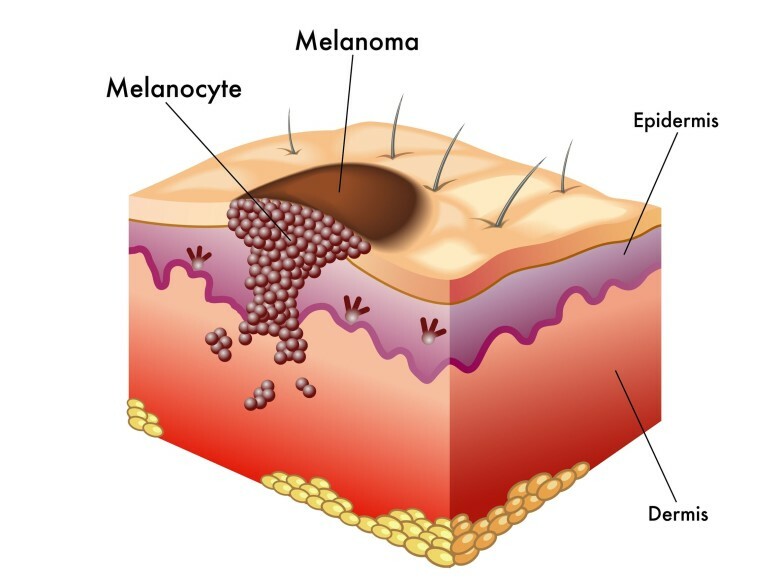 A melanoma develops when unrepaired skin cells with damaged DNA trigger mutations or genetic defects in the skin cells. These mutated skin cells multiply rapidly and form malignant tumors. These tumors begin in the pigment-producing melanocytes in the innermost layer of the epidermis. Many melanomas have a similar appearance, but it’s not always easy to identify potentially cancerous moles. If you are concerned about any moles, you should visit a skin specialist immediately. Melanomas often resemble moles, and some even develop from moles. The majority of melanomas are black or brown, but they can also be pink, red, purple or white. They fail the ABCDE test – They are Asymmetrical, have undefined Borders, they have Color variations, the Diameter is large than 6 mm and it appears to be growing or Evolving. Like any cancer, melanoma is best treated if it is caught in an early stage, which again speaks to the importance of performing regular self-checks. Although melanomas aren’t the most common type of skin cancer, they are by far the most deadly, accounting for more than 75,000 annual deaths. Caught early enough, treatment of melanomas can be very successful. If the doctor confirms that you are dealing with melanoma, they will recommend a surgical incision to remove the melanoma. If the melanoma is thin, the operation can be performed on an outpatient basis with the assistance of local anesthesia. The surgeon will cut away the melanoma and a small portion of healthy skin to ensure they’ve removed the whole tumor, and then the incision will be addressed with sutures or stitches. If the melanoma is larger, a more extensive surgery may be necessary, but the method will be largely the same. For more information about skin cancer surgery, or to consult with a doctor about any concerning moles, contact us today.